A very interesting specimen is recorded in the catalogue of the Vertebrate Zoology Collection of the Royal B.C. Museum for April 19th, 1932. It was the body of a three day old bison donated by the Victoria Parks Department. It was the baby born in Victoria’s Beacon Hill Park to its bison parents Victoria and Albert. Figure 1. A rare photograph of the Beacon Hill Bison, named Victoria and Albert. May 21, 1929. J. Howard Chapman Photograph. Keddie Collection. Where did the Bison Come From? On November 9, 1928, William Straith, President of the Victoria Junior Chamber of Commerce, had advised the Victoria Park Committee that he had been trying to obtain two bison (buffalo) for the Beacon Hill Park Zoo. 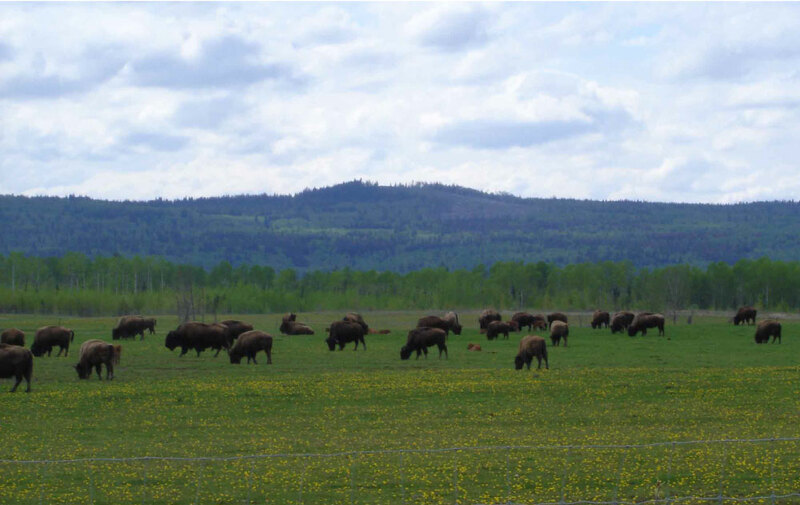 The Dominion (Federal) government allotted two from Alberta’s Buffalo National Park near Wainright where they had previously been brought from private herds in the U.S. The Canadian National Railway offered to ship them free. William Straith donated $250 toward the building of a stable and would try to raise the money for fencing (Archives CRS 76, 3B3-1). Figure 2. Bison in Vancouver’s Stanley Park in 1907. Keddie Collection. “The buffaloes, if they are to have anything resembling their native habitat, must have considerable space in which to roam. It is all very well to confine them in National Parks many square miles in area. It is quite a different thing to immure them in a confined space under wholly unfamiliar surroundings just for the purpose of titillating the curiosity of our residents and tourists. It is plainly evident that the transportation, accommodation and upkeep of these animals would cost thousands of dollars”. At the March 6, 1929 Park Committee meeting, a letter was read from the B.C. S.P.C.A. 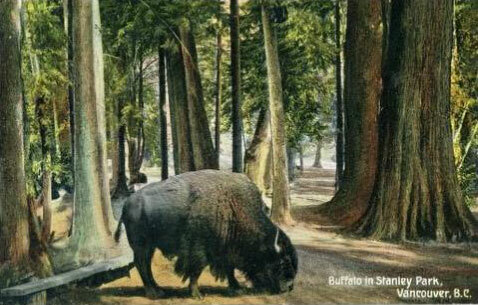 objecting to placing a pair of buffalo in Beacon Hill Park on the ground that “it is cruel and improper to move these animals from a cold dry climate to a wet climate.” The Committee decided to confer with “other Coast Cities on their experience” (Archives CRS 76, 3B3-1). Bison had previously been kept in Stanley Park. On March 20, Alderman Straith suggested that one half of the present deer enclosure be used for the bison. The Junior Chamber of Commerce would pay for the fencing. On March 27, Straith reported that the City would be required by the Dominion Government to “enter into a bond re the care of the buffalo” (Archive CRS 76, 3B3-1). The two-year old pair of bison, a cow and bull, arrived in Victoria on May 20. They were placed in a crate inside a C.N.R. boxcar for the four day trip from Wainright Alberta. After reaching the coast, they were brought by car ferry to the Point Ellice train dock in Victoria West and then by truck to the Park. Roderick MacLeod, who accompanied the bison, said that, compared to European zoo accommodation, the park facilities were “first class”. The Times newspaper explained that the bison “have a brand new log hut and a fair-sized run in which to exercise and even a few bushes where, if they want, they can escape the staring eyes of the public”. Their handler Roderick MacLeod said: “They will miss the herd for a while, but they have been penned at Wainwright for some time in order to make them used to it and will be perfectly at home in a few days.” He explained the young buffalo looked bedraggled because they still had their long, shaggy winter coats. The Times began a name campaign for the bison on May 21. The names chosen were those of late Queen Victoria and her husband Albert. The names were likely prompted by the fact that Queen Victoria’s birthday was on May 24 (Times, May 21, 1929:1&3; The Daily Colonist, May 22, 1929:5). The bison did not have long and happy lives. Victoria died in 1932, the same year as her calf, which was gored by Albert. This was the baby bison donated to the Museum (Catalogue # 001302). The Daily Colonist reported on April 20, 1932: “Buffalo Mourned. Victoria’s happy buffalo family is happy no more. Death has removed one of its members, a baby buffalo born to Victoria and Albert two weeks ago. An attempt was made to save its life, but the animal died yesterday”. This information would suggest that the baby was more than three days old when received by the Museum. The stuffed baby, continued to be loved as a taxidermy specimen on public display in the old Museum location in the East Wing of the Legislative buildings. Over the years it was extensively worn down by public patting and was discarded when the Museum prepared to move to its new location in 1968. There was, however, a calf that Victoria and Albert had the previous year that was sent to the Crawford Cattle Ranch near Fort St. John in the Peace River region for an experimental crossbreeding program with cattle (Figure 3 and Figure 4). Figure3. The offspring of Beacon Hill Parks Victoria and Albert. 1931. Unknown photographer. Reduced version of BCA D-00880. Figure 4. Baby bison on the Crawford Cattle Ranch. 1931. Unknown photographer. Reduced version of BCA D-00870. Figure 5. British Columbia Government Advertising in 1884. Keddie Collection. 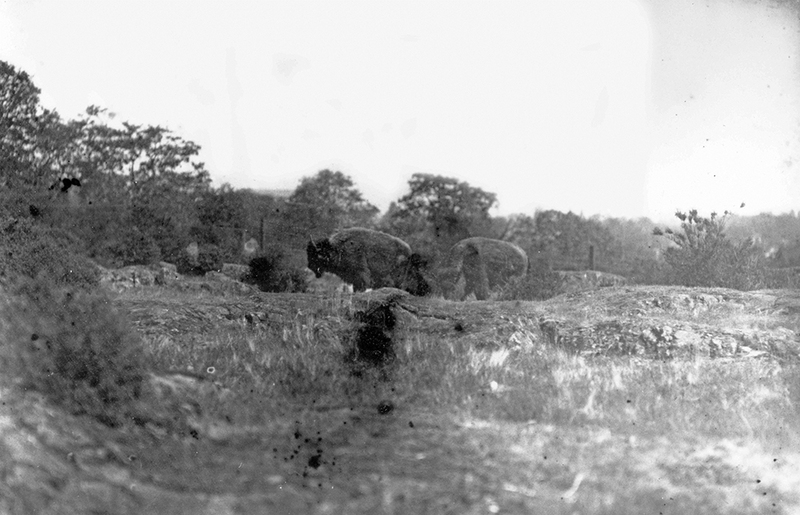 On May 9, 1935, the last bison in the Beacon Hill Park Zoo, Albert, was found dead. The bison were never replaced in the Park. Bison have an interesting history in this province. During the time when they were rapidly disappearing throughout North America the British Columbia government was still encouraging their extirpation from northern British Columbia, as exemplified by the 1884, B.C. 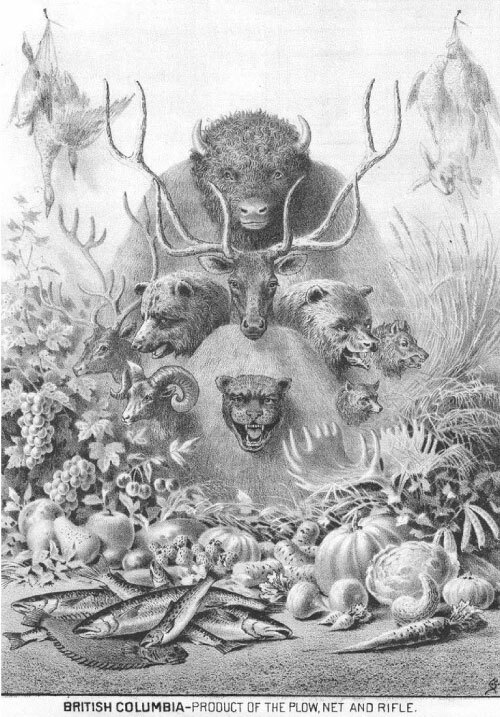 Government Advertising to Americans that show the animals that can be hunted in British Columbia (Figure 5). Bison are now making a major comeback in British Columbia via the ranching industry (Figure 6). The dating of specimens in the RBCM’s paleontological collection and the identification of pollen shows that Bison were previously in the Victoria region for a short period around 13,740 to 12,800 years ago. They lived in an environment which varied from grasslands to lodge pole pine parkland with pockets of popular trees. The scene may not have been too different than that seen in figure 6. For further reading see: The Loss and Return of Wild Bison. Royal BC Museum. Discovery. News and Events. July 1999, Vol. 27, No.2. Figure 6. Bison on a ranch in the Interior of British Columbia. Grant Keddie photograph May 20, 2006.